The 9th annual Falls Prevention Awareness Day (FPAD) will be observed on Sept. 22, 2016 - the first day of fall. The event raises awareness about how to prevent fall-related injuries among older adults. Falls present a real and growing risk to older adult's health and independence - and to their very lives. One out of every three person over age 65 fall each year. According to the National Council on Aging (NCOA), among people who fall, 20 to 30 percent suffer moderate to severe injuries such as lacerations, hip fractures and head traumas. We're here and focussed on bringing awareness of this public health issue to our community and to our patients. We hope to raise patient awareness for prevention and are here to help with interventions. We can teach our elderly patients about foot and ankle exercises, assist them with the purchase of safe footwear when necessary, and provide foot orthotics for stabilization. All of these suggestions are ideal for podiatric practice involvement in falls prevention, awareness and treatment. For more information about Falls Prevention Awareness Day, visit the NCOA by clicking here. 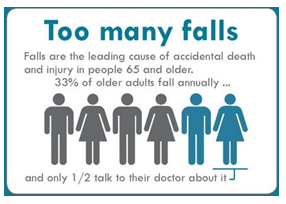 To see our podiatrists about preventing future falls, call 341-FOOT or schedule an appointment online at 341foot.com.